Over the last couple of months, I've been playing with model rockets.Â It's been more than 20 years since I last tried my hand at model rocketry - that experience ended in tears with my little rocket being squashed by a bus! I figured it was time to have another look. I've spent the last few months watching YouTube videos, visiting websites and reading as much as I could get my hands on.Â This weekend I launched my first rockets in more than 20 years.Â The first launch was a commercial kit by Semroc called 'Thuderbee'. 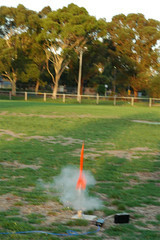 I built the rocket and, using a A3-4T motor, launched it to around 700' at the Dandenong Wetlands. This is the little beast! 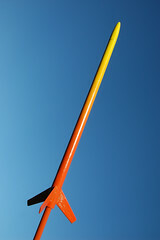 I purchased this from the fine folk at Suburban Rocketry in NSW. Full size images can be seen on my flickr page. Two more launches on the weekend, both scratch-built from the tip to the tail.Â My Big Red Rocket (It's orange, but we won't go into that) was the first to fly. 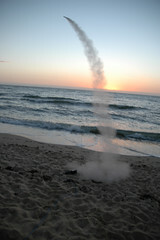 The ejection charge blew right after lift-off and left the nosecone and recovery streamer just near the launch pad. The rest of the rocket shot skywards. It could not be retreived. These launches also allowed me to test my relay-driven launch controller (which performed perfectly).